Go to LULU and save 20% in every purchase of Tumpeng, An Authentic Indonesian Food. Enter code SHOWOFF and save up to $50 through 11/30/2010. We believe that cultures influence the way you live including the way you cook. What happen if you have your origin culture and you live in another country? Would you adopt a new culture or would you blend them together with your origin culture? A new fusion culture is possible to be created. Fida Abbott, originated from Java, Indonesia and is living in United States, is able to blend two cultures in her cook book in series. She has a catchy name for her cook book series, AMERINDO KITCHEN. She created fusion food, Amerindo Food in series. She said in her interview that Amerindo Food meant American Food with Indonesian Touch. What a smart idea! She wrote her first Amerindo Kitchen book FABULOUS LEFTOVER TURKEY which is about American food and she is now publishing her second Amerindo Kitchen book TUMPENG which is about Indonesian food. Below is the interview with Fida Abbott by Resources for Mom and Kids regarding to her second Amerindo Kitchen book in series, Tumpeng. 1. I see from the book cover, the food looks like something grand, the array of food for grand festival or celebration. What does Tumpeng mean? Tumpeng is well known by Java, Bali, and Madura people as a cone-shaped rice dish like mountain with its side dishes. They can be vegetables and meat. It is traditionally featured in the slamatan ceremony. The rice itself could be plain steam rice, uduk rice (cooked with coconut milk), or yellow rice (uduk rice colored with turmeric). The cone shaped rice used to stand in the middle of tampah. Tampah is rounded woven bamboo container, covered with banana leaves and surrounded by assorted Indonesian dishes, such as urap vegetables, fried chicken, empal (sweet and spicy fried beef), abon sapi (beef floss), teri kacang (anchovy with peanuts), telur pindang (boiled marble egg), shredded omelet, sambal goreng tempe (sweet and dry fried tempeh), perkedel kentang (mashed potato fritters), perkedel jagung (corn fritters), sambal goreng ati (liver in chilli sauce), and many other things with carved vegetables or carved fruits as its decoration. People in Java, Bali, and Madura usually make Tumpeng to celebrate the important events. However, all Indonesians are familiar with Tumpeng. The philosophy of Tumpeng is related to the geographical condition of Indonesia, especially Java as a fertile island with numerous mountains and volcanoes. Tumpeng dated back to ancient Indonesian tradition that revered mountains as the abode of ancestors and gods. The cone-shaped rice meant to mimics the holy mountain. The feast served as some kind of thanksgiving for the abundance of harvest or any other blessings. 2. The word Amerindo is catchy. How did you get the idea to create this word? I found this name unexpectedly and coincidentally. When my daughter was several months old, in a night in the living room when she was awoke, I had conversation with my husband about our baby girl. I told her that she had a half of Indonesian blood and American blood and I had an idea to call her: Amerindo Baby. It means American and Indonesian baby. That was the word Amerindo came from. 3. 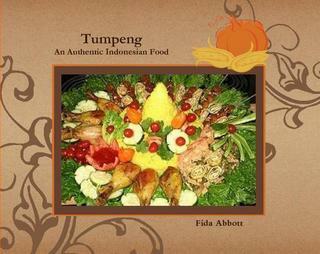 Is Tumpeng cookbook all about Indonesian food or do you include American food as well? Tumpeng is all about Indonesian food and some of them I have modified the ingredients to match with what American used to use. 4. How did you learn to cook Tumpeng? Is it from your family tradition or do you get inspiration from other Indonesian cookbooks? I have been familiar with Tumpeng since I was little child. My grandmother used to make Tumpeng for special Java celebration and I’ve learned from there. And of course I read many Tumpeng resources. 5. How do you overcome the obstacles of cooking Indonesian food such as Tumpeng if you are not in the country origin of the food itself? Some ingredients may not be available and some traditional cooking utensils are not found in US. When I didn’t find any ingredients that I had to use, I substitute them with what American ingredients have. For example: they don’t have fresh turmeric so I have to use turmeric powder; they don’t have tampah, I use large plastic tray or a big platter; they don’ t have a cone shape made from bamboo, I make it with hard paper or b-day cone hat. Sometimes I use other shapes besides a cone, by using cake pans/mouldings. 6. Unlike other cook books that have pictures and recipe of the food, you have made a difference in your cookbook that every food has a story, what is the story about? Some of them the story of how I used the substituted ingredients/ tools, etc. 7. Have you modified the way of cooking Tumpeng with your own way, make it more easy and more simple so every family is able to cook Tumpeng for a family celebration? Yes, and some of them I blend them with American style. For example: It’s difficult to find young grated coconut to make Urap-urap (a name of food), so I substitute it with red and white cabbage salad. It means I don’t need the young grated coconut anymore. 8. Talking about your passion in cooking and culture. Your origin is from Java and now you live in States. How does your origin culture influence your way of cooking in States? I almost cook rice twice-four times per week and the rest of the days in a week, I cook American food. 9. Amerindo Kitchen in series, how do you plan to write each cookbook? Does each book talk about specific different food? Are they all about Indonesian and American fusion food as its name Amerindo? Yes, each book will talk about specific different food and all will be about Indonesian and American fusion food. My husband had an idea for me that Amerindo Food is American food with an Indonesian touch. I love that idea!!! 10. Who is your target market for this cookbook? Everybody who has passion in cooking, everybody who loves to learn about Indonesian food, everybody who likes to try the new recipes, everybody who likes to collect cookbooks and/or give it as a gift. Fida Abbott is from Indonesia and now she lives in Pennsylvania with her husband and her little daughter. Her passion in writing has brought her to be an author for several books: What Does Mommy Teach Me? (e-book for Christian Children), Dancing in My World (e-book of Poem Anthology), Amerindo Kitchen in Series (cookbooks in series), and Enthusiasm, A Novel Based on the Author’s Own True Story, which it has won Pinnacle Book Achievement Award from North American Bookdealers Exchange (NABE). Now she is having a project to translate that novel from English to Indonesian—Enthusiasm will be published next year in Indonesia. More details about her profile, you may visit her website at Fida Abbott or her personal blog at Fida’s blog; and special details about her novel, Enthusiasm, you may visit her online media kit. Resources for Moms and Kids is owned by Viviana Widjaja (Malaysia). She is a work at home mom of two kids, living in Malaysia with many interests. She runs an online toys store, Kidzpuzzle and shares her knowledge and experience in parenting at Resources for Moms and Kids as well as professional blogging at Guide to Pro Blogging. She is also one of the team leaders in The Million Dollar Mom besides running Internet Business Strategy Training Centre and coaching moms who want to build their internet network marketing home business. She passionately encourages every mom to build an online home business and embrace internet skills.